Afghanistan may not seem like the most obvious tourist destination, but as the country navigates itself through the winding path toward stability and democracy, tourism will be key to its economic development and help Afghanistan break away from its reliance on foreign aid and poppy production. Although Afghanistan's reputation in the West may still be of a country blighted by war and conflict, with a history of medieval regimes, tribal law, and for being the source of the majority of heroin found on the streets of London and New York, it actually had a relatively successful tourist industry in the 70s when Kabul was very much part of the "hippy trail." Since then, the country famously slipped into civil war following the successful repulsion of the invading Soviet Army by the Mujahedin. The result was a power struggle that saw horrific infighting amongst the warlords competing for control of the country and specifically Kabul. These warlords, formally united against their common Soviet enemy and supported by the West, ended up fighting brutal and bloody battles in the streets of Kabul, causing devastation and huge death tolls. Ironically it was as a consequence of this that the Taliban formed and seized power in an attempt to purify the country with their own brand of Islamic Sharia law. The first generation of international backpackers, setting the blueprint for millions of gap year students and making million dollar industries for the likes of Lonely Planet and Rough Guide publishing houses, were lured by the promise of eastern philosophy, cheap living, and even cheaper hashish, and made the overland trip from London to Kathmandu through Europe, Turkey, and Iran before crossing into Afghanistan and then on to Pakistan, India and Nepal. In Afghanistan they would cross the country taking in Herat, Mazaar-e-Sharif, or Kandahaar on their way to Kabul and Bamiyan. Kabul was an almost unimaginably different city in those days. Afghan women walked the streets in mini skirts, western films played in the cinemas, locals mixed with Westerners, eating and drinking in open air restaurants and dancing together in nightclubs. Things soon changed and the modern image of Afghanistan was born, where women walk the streets ten paces behind their husbands covered from head to toe in burkas, music and TV are banned, and the only westerners on show are the aid workers and journalists foolish enough to stay behind. Things have certainly improved since the 2002 invasion although the majority of women still wear burkas, music and TV are no longer banned, and there are more Western aid workers, contractors, and soldiers of the NATO led International Security Assistance Force (ISAF) patrolling the city. However, the country is still not regarded as safe. The British Foreign Office and the US State Department still "strongly advise (against) all but non essential travel" and only last week three people were killed, including a German peace keeper, by suicide car bombers in Kabul. In short, foreigners are still a target. Commentators were concerned that the recent elections would see a resurgence in violence from Taliban and al Qaeda sympathisers trying to destabilize the democratic process. There were pockets of activity but not enough to deter the Afghan people from turning out in force for their first opportunity to vote for their own government in over 30 years. Although all is not rosy in Afghanistan and Hamid Karzai recently questioned America's approach and policy in the country, the Afghan people's response to the elections and democracy has been a positive sign for all parties and particularly the American foreign policy and military planners who no doubt wish things were going as well in Iraq. It is obviously hoped that with democracy will come stability and safety, and it is then that tourism in Afghanistan will be given an opportunity to flourish. "Afghanistan is one of the least developed countries in the world. The political instability and war in the last two and half decades left this country in ruin. 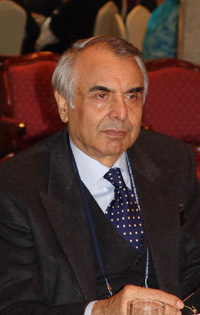 Afghanistan is an agricultural country (with) a bargain of natural resources," said Seoul's Afghanistan Ambassador Nabil Malek-Asghar. "In order to develop other sectors of the community, tourism plays a major role." The country has some of the world's most outstanding natural beauty and historical sites that equal any country: from the Buddhist sites of Bamiyan to the Mazar-e-Sharif Shrine. This, along with the legendary Afghan hospitality, suggests that success and income through tourism are inevitable. 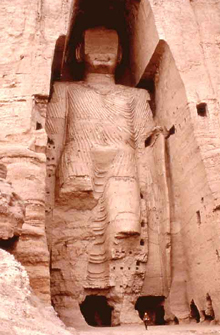 The 10-storey high Buddhas of Bamiyan carved into the rock face on the edge of the Bamiyan valley in central Afghanistan are infamous for being blown up by the Taliban in 2000. There has been ongoing discussion about the fate of the site since the Americans removed the Taliban from power in 2001, including rumours of UNESCO grants to rebuild the statues and the most recent suggestion that a famous Japanese artist recreate the Buddhas in a laser light display. Whatever they choose to do, Bamiyan will become a major international tourist attraction in its own right. It not only has unique religious heritage but it is also situated in one of the most beautiful 100 km long, green, sweeping valleys in an untouched landscape. 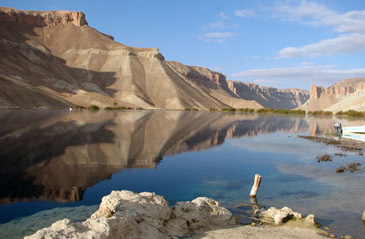 Close by are the high altitude azure lakes of Band-e-Amir, which will ensure that Bamiyan is the first stop on any tour itinerary from Kabul when they finally get the new road built. The United Nations co-ordinator of the aid effort in Bamiyan, Peter Maxwell, also says that tourism will play a major role in bringing money to the region. "What I hope very much is that Bamiyan as a cultural centre will actually be starting to come on stream [with its] Buddha sites and the Band-e-Amir lakes and other world-class attractions," he said. "That brings us on to the four or five year spectrum, where I think you really will see good roads, lots of tourists - that will mean that Bamiyan is where it deserves to be, a major and worldwide attraction, which will have quite transformed economic prospects for this area." Although Bamiyan is undoubtedly a potential World Heritage Site, Afghanistan has plenty more to offer. As part of the ancient Silk Road and more recently the "hippy trail," Kabul city itself is a lure for many travellers. Although ravaged by war, its ancient bazaars, street traders, and mosques are truly captivating. The main focus of tourism in the city is Chicken Street. Popular in the 60s, the street is lined with handicraft shops selling everything from lapis lazuli and carpets to Herati glass and Uzbek embroidery. They even sell traditional handmade carpets commemorating the American invasion and depicting B-52s dropping bombs on the mountains of the Hindu Kush. The return of foreign aid workers and journalists has seen a long awaited revival in fortunes for the traders of Chicken Street. Northeast of Kabul lie the Hindu Kush mountains famed for their cave complex hideout where Osama bin Laden was last known to have been and where the Americans' subsequent bombing campaign at Tora Bora failed to flush him out. Earlier this year a team of Italian mountaineers, Mountain Wilderness, started training former war lords and Mujuhadeen fighters, who have spent their lives in the mountains, how to become qualified mountain guides in anticipation of an influx of adventure tourists and particularly climbers. 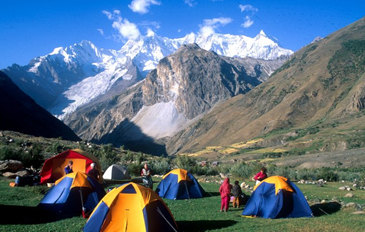 The peaks have been inaccessible for the past thirty years, so they predict great interest from mountaineers the world over vying to make first assents on some of the highest faces and peaks in the world. The former freedom fighters will be replacing their Kalashnikovs with ice axes and taking advantage of this lucrative opportunity. 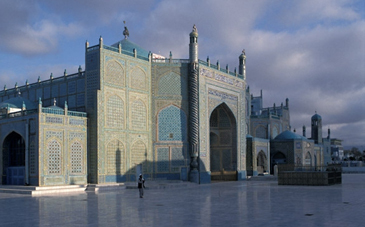 These are just a few examples of some of the tourist opportunities for Afghanistan, not to mention the plethora of Mosques and Shrines that litter the vast country. Afghanistan is still a long way from mass tourism, but as stability and safety continue to improve, the more adventurous independent travellers will start to dip their toes into this seemingly uncharted land. The unstoppable wheel of tourism will soon start to roll as greater numbers follow in the footsteps of these more intrepid travellers, and we may see a repeat of what is happening in Cambodia, where the streets of Siem Reap are filled with five star hotels and international jet setters flying directly into the local airport to marvel at the temples of Angkor Wat and as a result investing huge amounts of foreign currency into a country in desperate need of economic help. Mr. Adam Dean serves as staff writer and photo journalist for The Seoul Times. He majored in fine arts valuation at Southampton Institute, UK, and worked as a communications and marketing specialist for a leading consultancy in London before he arrived in Seoul in July 2005. He has also traveled independently overland through Asia and the Middle East.